DCI DVD/broadcast producer Tom Blair took some time to spell out what will happen at the DCI Cinema Classic on Thursday, April 21, 2005. That's when the top 12 DCI shows of all time will be shown at Regal, United Artists or Edwards Cinema near you, in explosive, remastered digital 5.1 surround sound! List of 12 corps to be shown at DCI Classic Countdown The show will be hosted by Steve Rondinaro and Michael Cesario. Blair said, "As two of drum corps' most knowledgeable personalities, they will provide an historical framework to give insight and perspective for the corps the fans have chosen. We will be shooting the on-camera segments at Gillette Stadium in Foxboro, to give fans a preview of this new and exciting home of the 2005 World Championship." Top: Tom Blair (left) & Cory Coken remixing the 1976 Blue Devils. 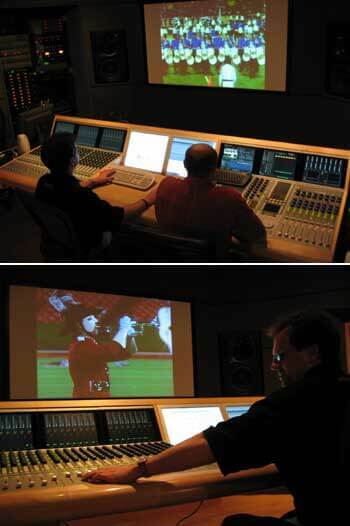 Bottom: Tom Blair remixing the 1989 Santa Clara Vanguard. Blair was recently remixing al the corps audio segments in surround sound for the theater broadcast. "I gotta tell you -- and I was working on this last Tuesday -- the early corps sound phenomenal in surround. Much better than I ever expected. They sound really good! We've been able to create great quality that will really come through in the theaters. Madison '75 is still the loudest damned horn line, even from the other side of the field! But all the corps will sound great in the theater setting, with a couple thousand watts behind them. I hope their amps go to 11," Blair said. One past drum corps season in particular has Blair reminiscing. "1976 has always had a special place in my heart, because that was the first Finals that I went to. I remember climbing into my friend's Vega station wagon at 4 in the morning and driving from Detroit to Philadelphia with a cooler full of sub sandwiches. All the corps from that year are special, but Blue Devils were "the deal." They were one of the benchmark corps in our history; one that change the direction of the activity. And, I had forgotten how many gags and great moments were in the Velvet Knights in 1992. That was a really entertaining show, because even though the gags were funny, they could still play their drums and horns with quality. It makes all the difference. It has really been very interesting to string this group of corps together," Blair said. Blair has a passion for showcasing DCI's history and depth. "I love working on projects that bring the rich history and tradition of drum corps to light for the modern fans. Creating "Brass Roots" was great because I was able to capture some of the spoken history of DCI from the men who created it. I guess at age 45, I'm officially old, but I think that gives me perspective to appreciate the incredible journey drum corps has taken. I see the quality and artistry that exists today and I know from where it came. I have watched every minute of every corps in the recorded history of DCI Finals. In some ways, I have become the protector of DCI's legacy, by constantly working to preserve the video and audio history of the DCI era. Fortunately for the fans, DCI takes these productions very seriously. Because after the last note resonates out of the stadium on Finals night, what I put on tape is all we have left," Blair said. Tickets for DCI's 2005 Classic Countdown cost $12.50. Tickets can be purchased now bigscreenclassroom.com or at participating Regal, United Artist and Edwards theater box offices. Stay tuned to DCI.org for other details as they become available.